Nestled in a natural environment only a few meters away from the beach, the Dorint Strandhotel in Wustrow offers modern, comfortable rooms and a complete set of wellbeing and fitness facilities, which will make your stay very pleasurable. The hotel offers 97 rooms and 50 suites equipped with a direct dial telephone, hairdryer, satellite/pay TV, mini-bar, work desk with lamp, modem port, and tea/coffee facilities. The hotel's restaurant, the "Quarterdeck", invites guests to taste the best specialties of the region, and also offers a balanced menu of healthy and vegetarian dishes. 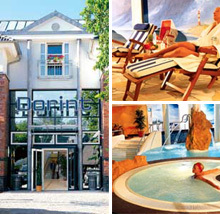 The Dorint Strandhotel offers an extensive wellness area with an indoor swimming pool, waterfalls, aromatic baths, multi-jet showers, whirlpool, steam baths, Finnish sauna, and solarium. A wide range of body therapies and beauty treatments is available to guests. The hotel's calm and relaxing atmosphere creates the ideal conditions for successful seminars and training sessions. Four meeting rooms are adequately equipped and furnished to achieve the best possible results. Additional facilities and services available at the hotel include a car park, underground garage, child care services, shoeshine machine, currency exchange services, and safe deposit box at the front desk. Pets are allowed. The USD rates fluctuate according to the EURO rate of exchange. The Dorint Strandhotel is located 100 meters away from a sandy beach, surrounded by unspoilt nature - between the Baltic Sea and the "Bodde" landscape in Wustrow.